Using Screenhunter free to create screenshots. The free program distinguishes between snapshots of the entire desktop, the current window or a rectangular area using the mouse dragging. You select the desired function and taking the screenshots then on hotkeys (keyboard shortcuts) that you individually control. If desired, also the mouse is on the image captured. further more, up to 120 seconds of time delay possible. The images are in a folder specified with one of them selected file name systematics as bmp, jpg or gif image. Using the clipboard, paste the image into other applications, such as in your word processor. In addition to the "free"version there are Screenhunter in two paid versions. In the"pro" or "plus"version offers additional features: a built in editor for image editing, multi monitor support, additional snapshot modes (say for scrolling a window), the pdf as the export format, and much more. 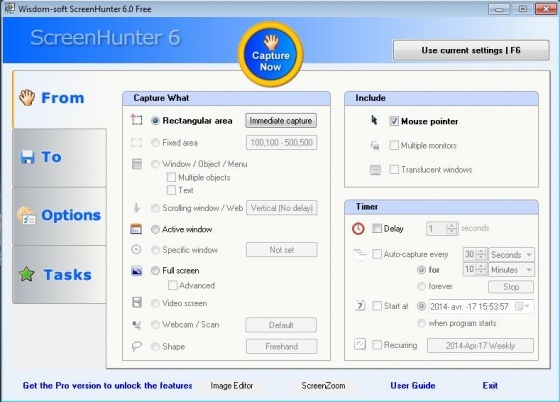 You can free download ScreenHunter Free latest full version from LoadSafeSoft.